Ceremonies were held in Germany on 10 May 08 to mark the 75th anniversary of the burning of thousands of books organised by the Nazis three months after Adolf Hitler came to power. The works of eminent German language authors such as Sigmund Freud and Heinrich Heiner were destroyed in fires across Germany on May 10, 1933. The Nazis called it a cleansing of decadent literature. Or Yehuda Deputy Mayor Uzi Aaron, who is affiliated with Shas said that the messianic Jews are indeed breaking the law and should be held legally accountable. He proudly confirmed taking part in the event. He declared the level of missionary activity in his city to be intolerable, with messianic Jews going house-to-house to distribute their materials. The burning of books has understandably created controversy. Some secularists questioned the wisdom of the decision to burn the books as well as the "moral values" of those involved. Dr. Efraim Zuroff of the Simon Wiesenthal Centre said that burning books has a negative association to the Holocaust. "It would have been preferable to find another way to dispose of the books and materials-but the main problem, the missionaries, remains." "We must respect holy writings of Islam and Christianity," Dr. Zuroff adds, "but we may not permit missionary activities targeting our youth," he concluded." A lawyer representing the missionaries, said that the action of the Orthodox Jews is illegal and immoral, also drawing an analogy to the Nazis who burned Jewish books, leading to violence and the Holocaust. He noted that since the establishment of the Israel, not a single person has been tried for missionary activities, which are illegal when directed to minors. Messianic Jews still see themselves as members of the Jewish people, entitled to the full protection of the law and the basic civil rights enjoyed by all Israelis. 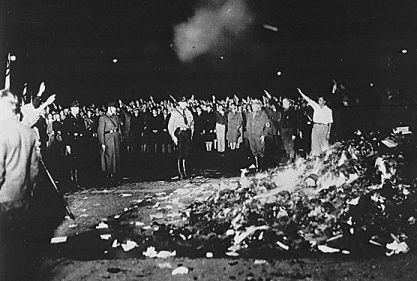 Even in the 21st century, book burning has a growing and dishonourable history.